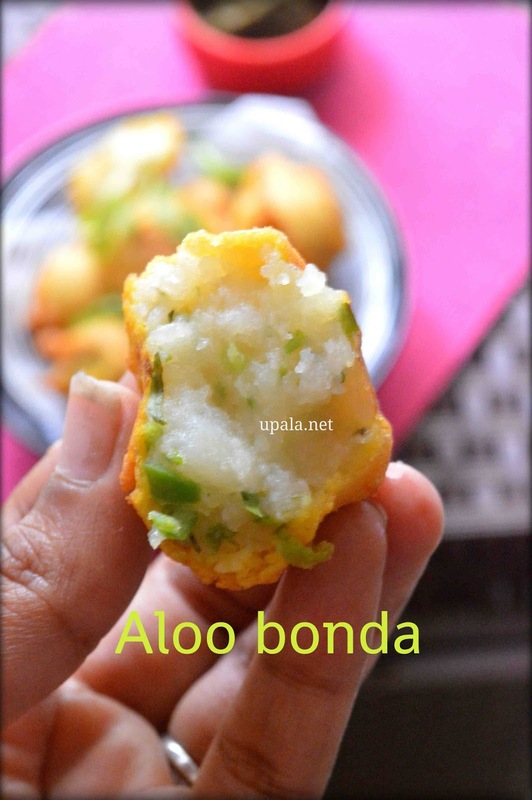 Aloo Bonda/Batata vada/Urulaikizhangu Bonda is a yummy evening snack prepared with potatoes. This No onion No Garlic snack is easy to prepare and one of the favourite for Kids. 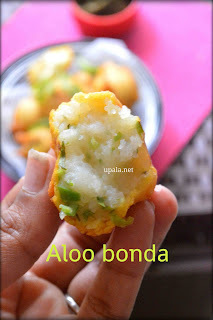 The speciality about this bonda is the highlighted sour taste of Lemon and Coriander flavour. 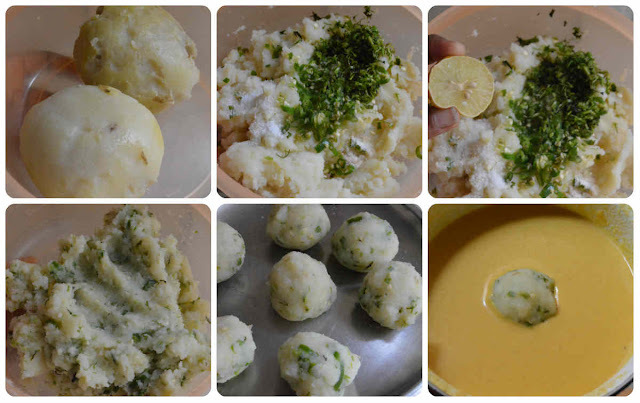 1) Boil the potatoes, after it cools peel the skin and mash it well. 2) Add Green chillies, Coriander leaves, Salt, lime juice and mix well. 3) Make medium size round balls of equal size and keep aside. 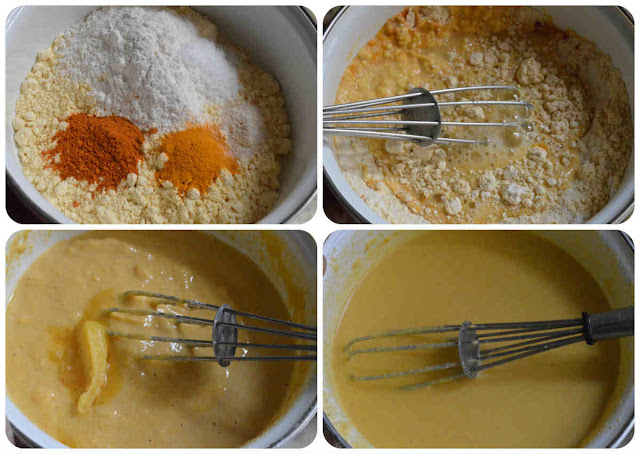 4) Now batter preparation : Add Gram flour, Rice flour, Salt, Turmeric powder, Red chilli powder, Hing in a bowl and mix well. 5) Add enough water and mix well with a whipper to form medium thick batter. Then add Ghee and mix again. 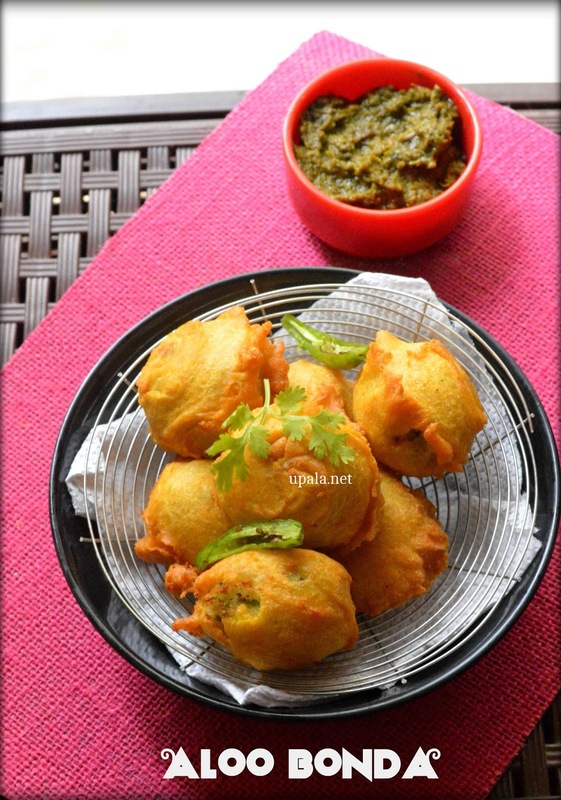 6) Heat oil in a kadai, in mean time dip the potato balls one by one in the batter and coat evenly. 7) Drop these balls one by one in hot oil. I have dropped three bondas and fried them together in medium flame. After one side is cooked, flip it around to cook the other side. 8) After both sides turn crispy, remove from oil and place on paper napkins to absorb extra oil. Repeat the same for rest of the bondas. Enjoy these Yummy Urulaikizhangu bondas with Green chutney or Tomato Sauce.